Hexawise: During your 20 years at Microsoft you have been involved in hiring many software testers. What do you look for when choosing software testers? 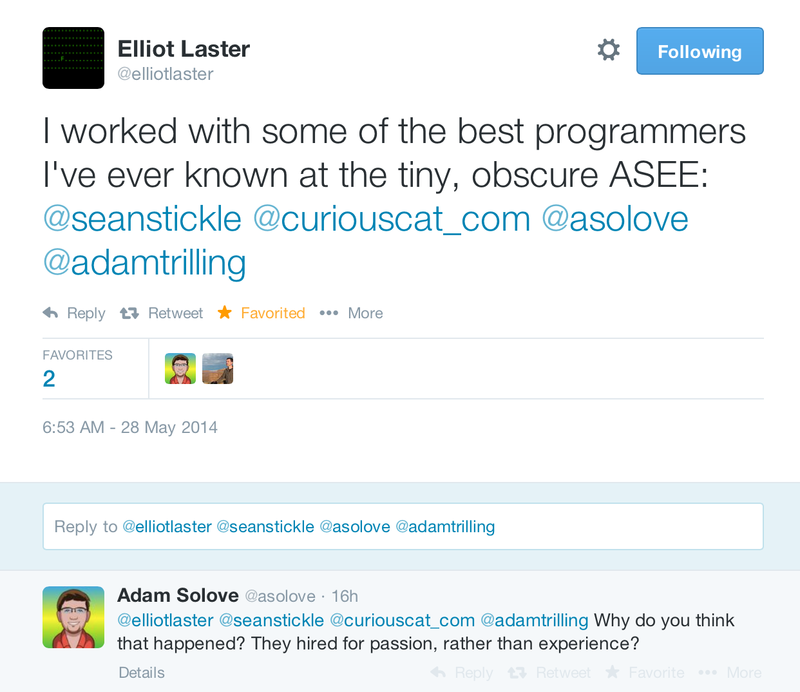 What suggestions do you have for those looking to advance in their in software testing career? Alan: The biggest thing I look for in testers is a passion and ability to learn. I’ve interviewed hundreds of testers, including many who came from top universities with advanced degrees who just weren’t excited about learning. For them, maybe learning was a means to an end, but not something they were passionate about. The testers who really impress me are those who love to learn – not just about testing, but about many different things. Critical thinking and problem solving are also quite important. As far as suggestions go, keep building your tool box. As long as you’re willing to try new things, you’ll always be able to find challenging, fun work. As soon as you think you know it all, you will be stuck in your career. Hexawise: It seems to me that testing games would have significant challenges not found in testing fairly straightforward business applications. Could you share some strategies for coping with those challenges? Alan: Combinatorial testing is actually pretty useful in game testing. For example, consider a role-playing game with six races, ten character classes, four different factions, plus a choice for gender. That’s 480 unique combinations to test! Fortunately, this has been proven to be an area where isolating pairs (or triples) of variations makes testing possible, while still finding critical bugs. Beyond that, testing games requires a lot of human eyeballs and critical thinking to ensure gameplay makes sense, objects are in the right places, etc. I’ve never seen a case where automating gameplay, for example, has been successful. I have, however, seen some really innovative tools written by testers to help make game testing much easier, and much more effective. Hexawise: When looking to automate tests one thing people sometimes overlook is that given the new process it may well be wise to add more tests than existed before. If all test cases were manually completed that list of cases would naturally have been limited by the cost of repeatedly manually checking so many test cases in regression testing. If you automate the tests it may well be wise to expand the breadth of variations in order to catch bugs caused by the interaction of various parameter values. What are your thoughts on this idea? Dot: Nice analogy – I like the term “grapefruit juice bugs”. Using some of the combinatorial techniques is a good way to cover more combinations in a reasonably rigorous way. Automation can help to run more tests (provided that expected results are available for them) and may be a good way to implement the combination tests, using pair-wise and/or orthogonal arrays. This entry was posted in Software Development and tagged interview, Software Development, software testing on March 20, 2017 by John Hunter. Take great care in adding constraints to processes to avoid doing so needlessly. Online you will frequently find forms that have required fields that needn’t be. Certainly if you were designing with focus on what is best for customers those requirements rarely make sense. Occasionally a required field is a sensible constraint on an online form but so often they add unnecessary constraints. I frequently find those forms even requiring a false answer since a response is required and none of the options are true. Often this is because the organization is thinking of the boxes they expect users to fit themselves into rather than thinking how to create the best user experience. I wrote previously about a company representative that suggested a customer change their name because the computer system didn’t accept names with 2 characters. Constraints on creating a secure password are a frequent failure of web sites for the last 10 years. because Wu Jianping has no arms, creditors claimed they could not give him a loan since he was unable to be fingerprinted. After the case was publicized and there was a great deal of negative publicity on social media the banks modified their process and approved the loan. But your organization shouldn’t have as the mistake-proofing (obviously not mistake-proofing at all) that when the process doesn’t quite work well then rely on a massive social media outcry which is a signal to us to straighten out the issue. This entry was posted in Customer focus, IT, Software Development and tagged bad customer service, Customer focus, customer service, IT, mistake-proofing, process thinking, tips on November 23, 2016 by John Hunter. My response to a question on Reddit. Does anybody have any thoughts on the validity of the above statement? I agree with those ideas. Software testing is a bit different (at least some of it is) from the inspection mentioned above. You are testing while the product is being developed and adjustments are being made before the product is released to customers. Also with internet based software you have the ability to update the software and now all users have that update. Where for physical devices they already have the product and the only option is a recall which is very expensive and often ignored. Software testing however should pay attention to those points in the 2 links above (defects should be understood as evidence of a process that needs to be improved so defects are not built in the first place). What you want is not just to fix the bugs software testers catch but figure out the reasons those bugs were created and improve you process so you create fewer bugs in the future. No matter what the software quality is based on the code that is written. At the best software testing can tell people about the bugs but unless the code is fixed the software quality didn’t change. But to say that software testing doesn’t have a big influence of software quality when testing is well done and the software development process is good (listens to feedback and improves) is not very accurate. This entry was posted in IT, Software Development and tagged Deming, inspection, quality, Software Development, software testing on May 9, 2016 by John Hunter. I understand the regular Uber app not having a functional website. Uber Eats not having a functional website is super lame. It strikes me similar to Walmart 15 years ago telling people “we only have stores go to them, we just use the internet for advertising our stores.” Today for Uber: we only have apps, “we only use the web for advertising our apps.” Both you and Walmart want to use a limited function service that you both are comfortable with and want users to just put up with annoyance because neither of you want users using the connivence of the web. When you bother to create a functional website maybe I’ll use it (I use several food delivery services now). Using limited apps is rarely wise (unless you are crippled by the lack of a real computer and are stuck having to use just an app). Uber cars is a rare exception where the needs are so simple a limited app is ok. Picking restaurants and food on a tiny screen with a crippled app is just a lousy experience for anyone that uses real websites. The Ux for the app is horrible. Just like old school businesses were only comfortable with their old business models and didn’t create functional websites (instead using the web just to advertise that you should go to their store, or giving you forms to complete and fax back to them…) new businesses are often stuck on only using apps even though they often provide a lousy user experience compared to a functional website. There are some apps that are very useful and not having a functional web app can make sense, but it is fairly limited. Getting a ride apps I can see as only apps. Driving instructions and live maps using GPS to locate you is another great app use. Boarding passes can make sense (though I do question some of that whole process conceptually this could be a good example of a app with no functional website). 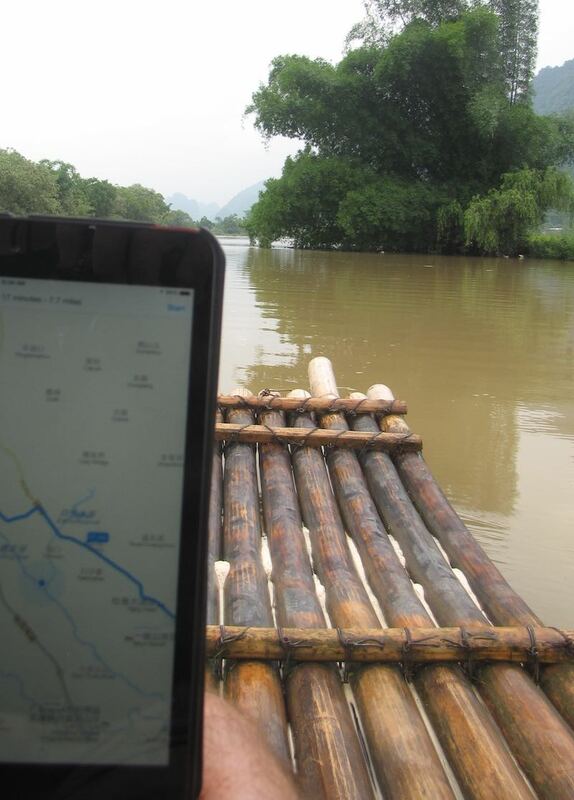 Map app showing my GPS location while I floated down a river on bamboo raft in Yangshuo, China. But most cases not having a functional website is just lousy Ux. Now there are some times when using technology to provide good service just isn’t worth the effort. Often though businesses just are stuck in their fax-thinking or physical-store-thinking or app-thinking and fail to use a technology that would provide great benefit to their users. I find it odd how often app vendors seem stuck in their app mindset. It wasn’t so surprising old businesses that were not based on technology didn’t take advantage of the incredible opportunities provided by the internet and the web. But it is less understandable when companies that are thought of as technology savvy are as blinded by their history (can’t see out of the app-mindset). This entry was posted in Customer focus, Innovation, IT, Software Development and tagged commentary, Customer focus, Innovation, internet, IT, Software Development on April 23, 2016 by John Hunter. In the 1980s software applications had to use click x, then click y, then click z type instructions to get you to a specific location in a software application (or at least they had a decent excuse to do that). Too many web application development organizations forget that they now have urls to direct people exactly where to go: and that they shouldn’t rely on ancient “click here, then there, then in that other place” type instructions. Here is an example I wrote up on my recent experience with iTunes and their failure to do this properly: Bad iTunes Ux and How to Submit a Podcast to iTunes. I see it all the time, that is just one example. On top of the waste inherent in click path instructions they often fail because the interface has changed and no one bothered to change the click path or the click path depends on other things being a certain way and they are not so the click path breaks. I really can’t comprehend how this usability failure is something I run across all the time. Urls are not some secret idea only PhD computer scientists have heard of. This is super basic stuff – click path instructions should never have been acceptable for any web application. It is pitiful they are still common among companies that see themselves as advanced software development organizations. Using the proper urls also will help make sure you are using human readable urls. Another super basic usability concept that is ignored far too often by some web application developers. This entry was posted in Customer focus, Software Development and tagged Customer focus, internet, IT, Software Development, tips, usability on August 14, 2014 by John Hunter. Adam Solove: Why do you think that happened? They hired for passion, rather than experience? If I had to pick one thing, passion would likely be it but really it is a complex assortment of things. Passion for the right things, based on what we aimed to be, mattered a great deal. That took the form of being passionate about the user experience, being passionate about good software development practices, being passionate about good software itself, being passionate about treating each other with respect, being passionate about learning and improving. I think there were several other important factors, such as: the skill to turn a passion for good software into actual good software. This required intelligence, interest and knowledge about software development but didn’t require specific experience (computer science degree, 2 years of Ruby on Rails development, certification or any such thing). Hiring based on experience is a big mistake. In my opinion hiring based on capability and potential (which is based partially on experience) is wise. Another factor is that we had people (those first few hires were critical) that were really knowledgable about programing good software and that became a self reinforcing process. The gaps one person’s ability and knowledge could be filled by someone else helping them understand and get better. The expectation was that we found great solutions. If we didn’t we kept looking and asked each other for help (another factor in creating a great team). We didn’t just accept that we were confident the solution wasn’t very good but couldn’t find any better options so I guess this is the best we can do. We were interested enough in good results that we would push for better options instead of just accepting something that was kind of ok. This shouldn’t be such a big deal; but in practice it is huge. So many places just end up avoiding conflict to the extent that it is a huge detriment to results. Without confidence, honest debate about ideas is suppressed as people are constantly taking things personally instead of trying to find the best ideas (and if doing so means my idea is criticized that is ok). Our group was great at this. It is something I find it a bit silly to say a workplace was “great” at but in most places I find the fear of someone being concerned stifles discussion to an unbelievable extent. This is also one of many areas where the culture within the team was self reinforcing. As new people came on they understood this practice. They saw it in practice. They could see it was about finding good ideas and if their idea was attacked they didn’t take it nearly as personally as most people do in most places. I sought to understand if people we looked at hiring would be comfortable in such an environment. This entry was posted in IT, Management, Popular, Software Development, Systems thinking and tagged curiouscat, hiring, John Hunter, managing people, organization as a system, Popular, Psychology, Software Development, teams on May 29, 2014 by John Hunter. Benjamin Mitchell – Using the Mutual Learning Model to achieve Double Loop Learning from Agileminds. Single loop learning is basically to just try again using the same understanding, thinking and tactics. It is understood that the results were not what was desired so we will try again, but the supporting system is not seen as the reason results were not the desired results. Double loop learning is when the result leads to questioning the system and attempting to adjust the system and make changes and experiment to learn to be able to create systems that get better results. This entry was posted in Management, Process improvement, Psychology, Software Development and tagged change, communication, Deming, management, management webcast, Process improvement, Psychology, theory of knowledge on October 8, 2012 by John Hunter.